Are you thrown when your kids lie? Sometimes they are little lies, like a three-year-old saying she brushed her teeth when she didn't. Other times it's about not actually doing a chore or more troubling, not handing in school assignments and saying all the work was done. What do you make of it? How can you decide what to do it if you don't understand it? First, ask yourself, "Why?" When three- and four-year-olds lie, they often don't feel like they've done something wrong because their sense of right and wrong isn't well-developed. So as a mother you see the toys are left out and you ask your three-year-old to put them the shelf. She says she will and you walk out of the room only to return and the job isn't done even though the little one said she did it. This is ego-centrism. She meant it when she said it as if agreeing was the deed in itself. She isn't out to get you upset, she just went and did something else that occurred to her after your request. This is an opportunity to teach right and wrong, but not time for a scolding until the child really gets what lying is all about. So take the misdeed as an opportunity to teach. It takes longer, but it meets your aim. Remember, she isn't quite ready to think about how you feel unless you tell her. For example, you can tell your child that when she says she puts the toy on the shelf and doesn't that's called a lie. Sit with her while she does carry out the deed and ask her again if she did it and now when she says, "Yes," you can praise her for telling the truth! Alas, you may go through this many, many times until she gets it. It's important to realize she's not a "bad child" just a three-year-old who only thinks of herself. By five or six, children know more clearly the difference between right and wrong, but they still haven't learned the nuances of lying and telling the truth. They are mostly concerned with approval. So, if they lie about finishing a chore and then rush and do it as if you won't know the difference, they realize they were lying and are just trying to stay out of trouble and get your approval. Again, I wouldn't jump to punishment because then you miss the opportunity of encouraging moral development. The punishment leads to resentment, not learning about feeling the importance of telling the truth for its own sake which is actually teaching morality. If you confront your child calmly with the fact that they lied and they won't get into trouble, you just want to talk about it, you will gain much more of a teaching opportunity. Talk about their fear of getting in trouble. Ask why they think they didn't do the task and why not telling the truth was wrong? If they give a jumbled up confused answer, again trying to give excuses and stay out of trouble, you know they don't get the essence of truth-telling as a virtue in itself. So more discussions are needed. Once teens begin to lie, it is still important to understand the meaning behind the behavior. That is using Parental Intelligence. If you jump to punish without understanding the intricacies behind the act of lying, you will just break down your relationship instead of emphasizing that your job is to teach telling the truth while also understanding what your teen is struggling with so he can get the help he needs. Ask yourself what was on his mind when he lied? Maybe the homework was too hard and your child is embarrassed to admit he needs help. Maybe your child doesn't like his teacher and resents doing assignments for him (very common). Maybe, he just tells you what you want to hear because it's what he wished he did and fears disappointing you and himself. There are many variations, but each is a catalyst for further communication about your child's troubles. Most kids don't lie in a pathological way which would mean professional help is needed. Most have reasons that can be understood and resolved and the lying goes away. Shoot for understanding: it builds parent-child bonds. 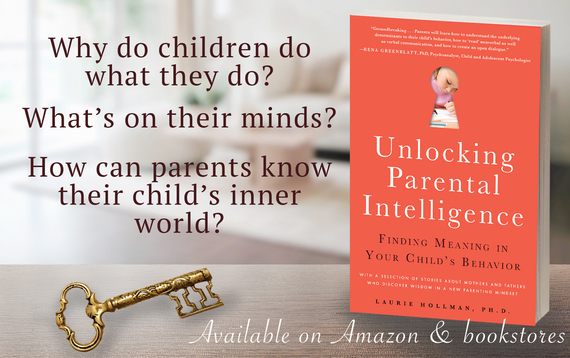 Laurie Hollman, Ph.D. is a psychoanalyst and author of Unlocking Parental Intelligence: Finding Meaning in Your Child's Behavior found on Amazon, Barnes & Noble, Familius and wherever books are sold.